One of the world’s top ten largest pharmaceutical companies needed to reach and inform Primary Care and Pediatric Nurse Practitioners and Physician Assistants, as well as School Nurses, who treat a specific medical condition. The goal was to change the behavior of these groups through education to increase use of the client’s new prescription medication. RNsights created an integrated marketing campaign aimed at educating the client’s target group of NPs, PAs and School Nurses. RNsights drove traffic to the client’s webinar and educational links through several tactics including email campaigns, community newsletters, sponsorship on RNsights’ online communities of healthcare professionals organized by specialty, and a custom w ebpage. RNsights used a multi-channel approach to effectively reach the client’s targets. RNsights increased awareness 380% beyond the client’s goal. 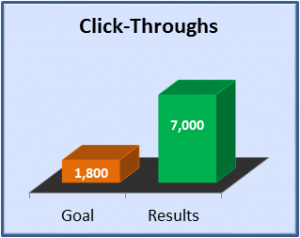 The pharmaceutical company wanted 100-200 healthcare professionals to click-through per month for a total of 1,200-2,400 click-throughs for the 12 month campaign. RNsights far surpassed the client’s expectation with almost 7,000 click-throughs to their webinar and educational materials far surpassing goals and projections.